Fix a processor bowl and attach flour kneading blade in it. Add maida and ghee to the processor bowl and run it to mix well. Now add water to the maida mixture and prepare dough. The dough should be firm and it should neither be too hard nor too soft. Heat a pan on medium heat. Add oil to the pan. 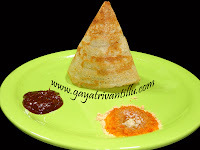 While the oil is getting heated up prepare gavvalu with the dough using Gavvala Peeta. Make small marble sized balls from the dough. Hold the Gavvala peeta with your left hand. Take a ball of dough and press it on the gavvala peeta with your thumb finger. The ball gets impressions of the ridges of the Gavvala Peeta. Now roll the flattened ball again with the thumb. Like this, prepare all gavvalu with the balls of dough. Spread a paper napkin on a plate and keep it near. Test the oil for hotness. Drop a small bit of dough into the hot oil. The dough should sit first and sizzle. After few seconds the dough should rise to the top—that means oil is sufficiently hot. If the dough comes at right when dropped in oil—that means oil is too hot. If the dough sits for a longer period at the bottom of the pan—that means oil is not hot enough. 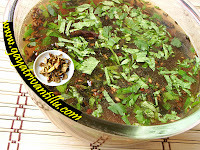 Add sufficient number of the prepared Gavvalu in oil. Wait for few seconds and then stir slowly. After few minutes observe that the shells are bulging in size. Fry till they are golden brown in color. For the right texture see the movie clip. Once done remove them from oil with a ladle and drain them on the paper napkin to remove excess oil. Now add another batch of gavvalu. When you start the second batch, heat a pan on another stove on low flame. Add sugar and water to that pan & mix till all sugar is melted.Meanwhile keep stirring the gavvalu in oil. Once fried to golden color remove the gavvalu from oil and drain them on a paper napkin to remove excess oil. Keep stirring the sugar mixture till it is sticky. Prepare the sugar syrup till it shows 120oC on candy thermometer. Now act fast. Then switch off the stove and add the fried gavvalu to the sugar syrup. Mix the gavvalu well to get nicely coated with the sugar syrup. As you keep stirring the sugar cools down and crystallizes. So be fast while mixing the gavvalu in sugar syrup. Spread the sugar coated gavvalu on a plate to cool down. Transfer them to a serving bowl and enjoy. Dough should be firm and smooth. The dough should be firm and it should neither be too hard nor too soft. Once the temperature on candy thermometer reaches 120oC, be fast and mix the gavvalu in the syrup. Otherwise the sugar will not be evenly coated to all the gavvalu. Enjoy these tasty sweet shells with your family members. My name is Lalitha. I am from Mumbai. Today I tried your recipe for Teepi Gavvalu. It has turned out wonderful!! Thank you very much for the recipe. I have a query. Is it possible to substitute Maida with Whole Wheat flour? And, in that case, what would be the measurements of the other ingredients, i.e. ghee (for kneading) and sugar (for the syrup). Please let me know. Once again, thank you for the wonderful recipe. i am swarupa.Nenu usa lo vuntanu. yestarday youtube lo mi video chusanu.Naku mi websight nachhindi. 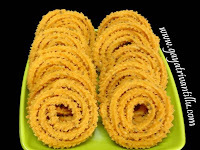 naku biscuits recipe kavali.Adi elagante sweet biscuits with egg ledante dalda to gani kavali(deep frying). meeku telste na mail id ki pampicha galaru. inkoka vishyam emitante teepi gavvalu recipe lo pakam ela ravali.na daggara candy thermometer ledu.meeru naku idea istara. Thanks for the feedback. I don't have the recipe for the biscuits you are looking for. However you may look into the following plain cookies or Wheat bran cookies recipe of mine which may be of some help. I am writing from USA. I like your cooking shows. Very clear and easy to cook. Can you please show how to make bobattlu on your website?